Pakuranga College’s young team has come away with the NZ Secondary Schools Senior Baseball title. Photo supplied. 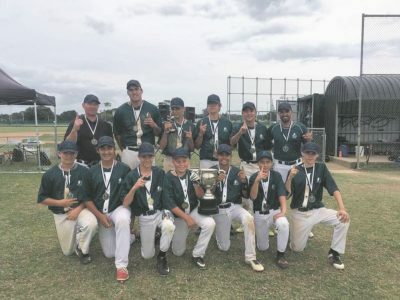 For the first time in many years, Pakuranga College sent a team to the New Zealand Secondary Schools Senior Baseball Championships that was held last week at Lloyd Elsmore Park. The young team coached by Johnathan Southey with help from Kenneth Cockerell, ended round robin pool as top seeds, securing them a spot in the final. In the final they met a strong One Tree Hill. The lead changed numerous times throughout the innings and in the final innings the match was at a standstill with 11-all. With Pakuranga the final side to bat, they dug deep and won 13-11. The team also had a few individuals who took home top accolades. Jayden Ruhe was named Batter of the Tournament and Traye Wildbore was named Player of the Tournament. These two along with international student Pablo Montano were also named in the tournament team.